If you ask me what I want for dinner I'll almost always say Mexican. I love the freshness of the dishes and all the flavours, especially the spice. And, let's get real… avocados are life. This past weekend I hosted a little pre-Cinco de Mayo get together with my girlfriends. I knew I'd have more time to prep on a Sunday afternoon then on a Thursday after work, and bonus, I get to inspire all your Cinco festivities taking place this week! We got together in our Mexican inspired outfits -aka everything off the shoulder- ate an insane amount of guacamole, and indulged in spicy grapefruit margaritas. It was a casual affair but we had such a blast, and the prep work was super minimal! All it takes is a few little details in terms of food choice and decorations and you are set to celebrate the Cinco in true Mexican fashion! 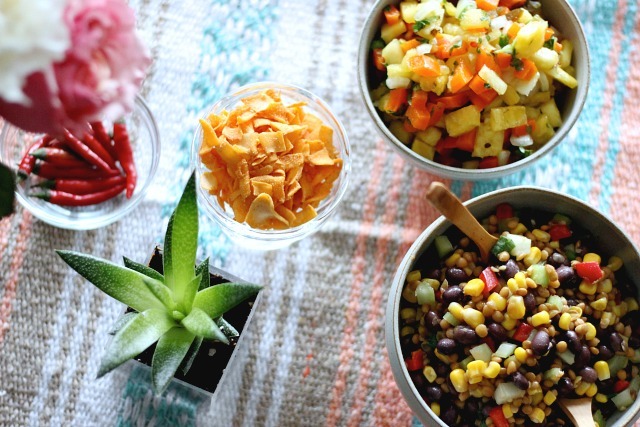 Here's how by adding a little extra effort in your hosting you can throw the ultimate Cinco de Mayo fiesta. 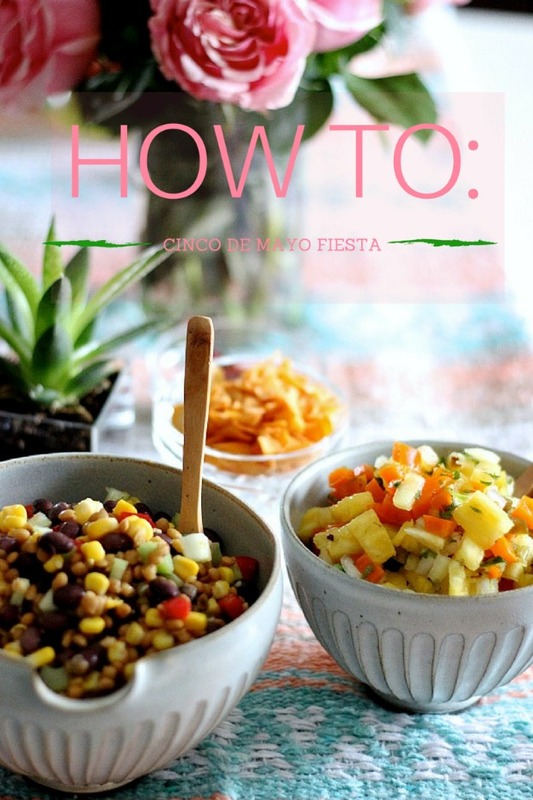 Food is the key component of you Cinco de Mayo party, and you don't need to go crazy! A few key dishes is all you need. My menu included shredded chicken tacos, a Mexican caviar (basically a melody of beans, corn, and veggies ), guacamole, pineapple salsa, and jalapeno poppers. For dessert I served cayenne black bean brownies. Since the theme is all things Mexican you need to serve the obligatory guacamole and salsa, and the salsa doesn't have to be boring and especially not from a jar! I served up my famous Mexican caviar dish. It's only famous because my girlfriends are obsessed with it and request it for every summer gathering! It's definitely the perfect side for a Cinco party-- serve on tacos, as a dip with chips, or as a salad, everyone will swoon! Here is a similar recipe. Next up was a new recipe for me; this pineapple salsa. Wow! I am now addicted. This could not be easier to make and it was amazing! So fresh and the heat was killer! A new favourite for sure. You can't taco 'bout a Cinco without tacos! I woke up the morning of and added some chicken in the slow cooker with orange juice, lime juice and spices. After letting it cook for 5 hours I pulled it apart using two forks. Topped on a corn tortilla with the above sides and you have such an easy take on tacos. Check out this easy, hassle free recipe. 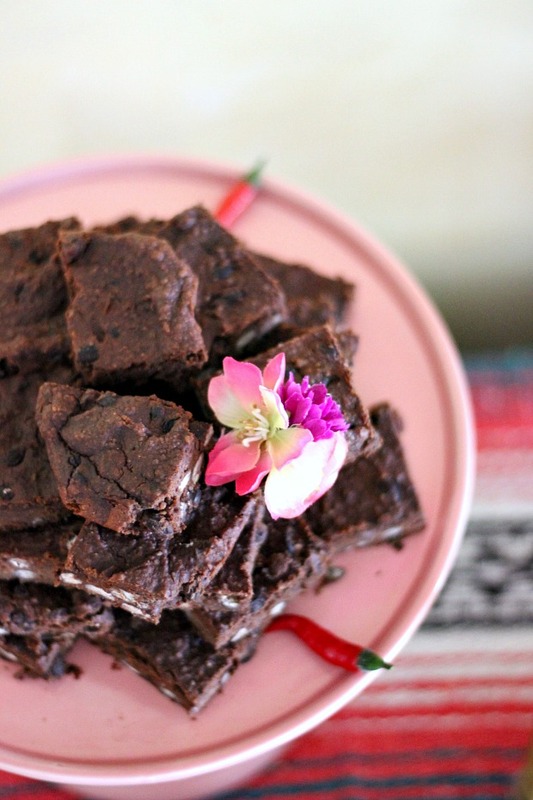 For dessert I adapted Deliciously Ella's black bean brownie recipe from her latest book. I subbed the raisins for 1/4 tsp of cayenne and 1 tsp of cinnamon to add a Mexican flare to the brownies. I also cut up pineapple to serve with chili powder and lime, and some round watermelon bites for a sweet snack. Tequila, tequila, tequila. Since coming back from Mexico my bestie and I had a few tricks tucked in our sombreros. We infused a bottle of José Cuervo with fresh pineapple. 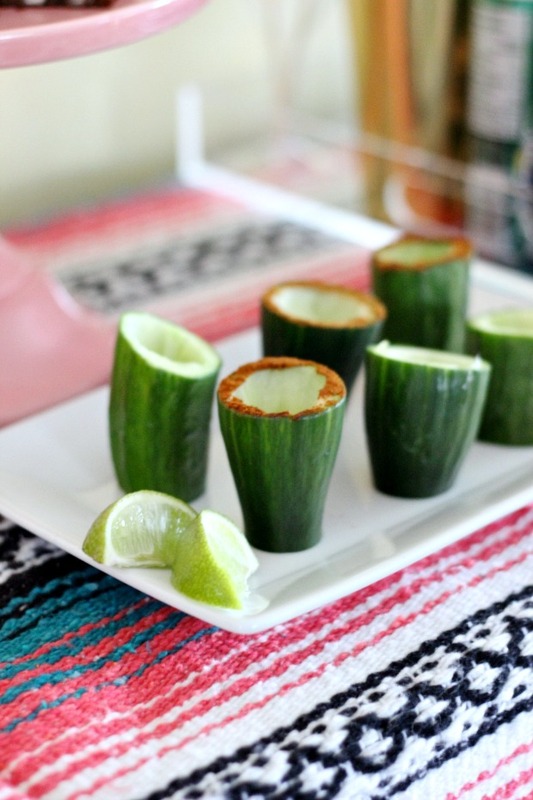 And also served tequila shots inside hollowed out cucumber ends. The rim was dipped in chili powder; talk about a flavour burst! Just be sure not to core out all the flesh of the cucumber. Bonus- you get to eat the cucumber afterwards! For our spicy grapefruit margaritas I squeezed fresh grapefruit and added cayenne to the juice. 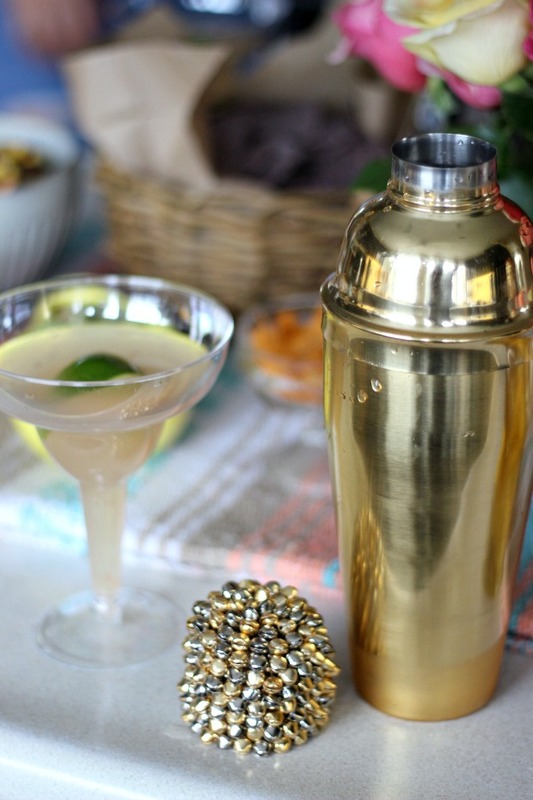 This was mixed with tequila, lime and a dash of sparkling water and made for the most refreshing afternoon cocktail. Anytime I'm hosting I love adding decorations that encompass the theme of the party to really set the vibe of the day, or night. 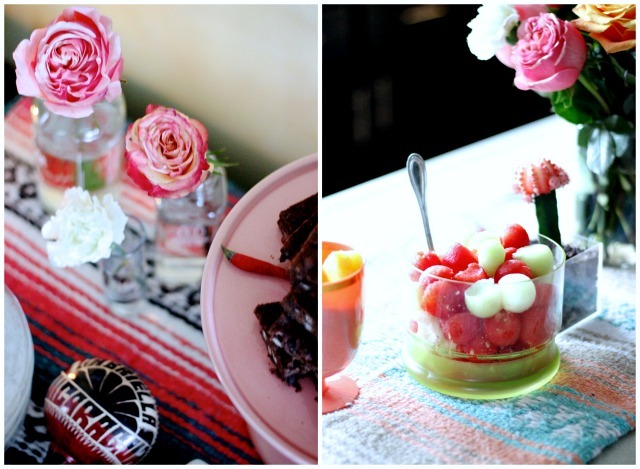 For this Mexican inspired affair I used the blankets I bought in Mexico as table runners. Not only were they perfect for the occasion but they also brought back some sweet memories! I love the designs and colours in the blankets, so I really drew on the bright pinks, corals and blues. I put one on the drink/dessert buffet and the other sat on the island where the food was. I love how the impact they made! I added other elements like bright florals, chill peppers, and cacti to decorate. Above the dessert buffet I strung together a colourful "papel picardo" inspired banner (literally means perforated paper), which is a common Mexican folk art tradition. 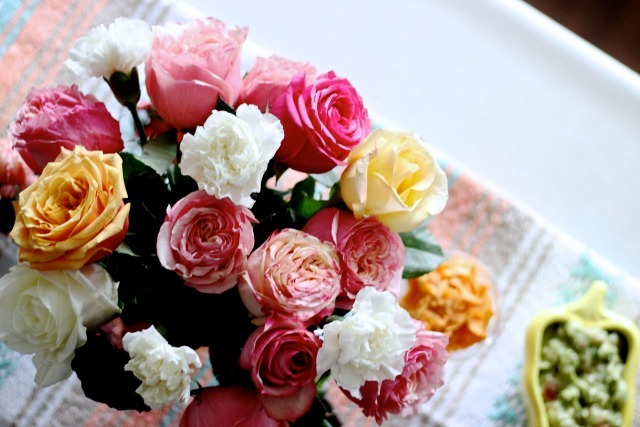 You can use tissue paper and let your inner crafty child come out as you fold and cut the paper. I used multicoloured construction paper. Here's an easy tutorial. I also put single stem flowers around the room in little jars. I brought out all my colourful dishes to go along with the bright colour scheme. 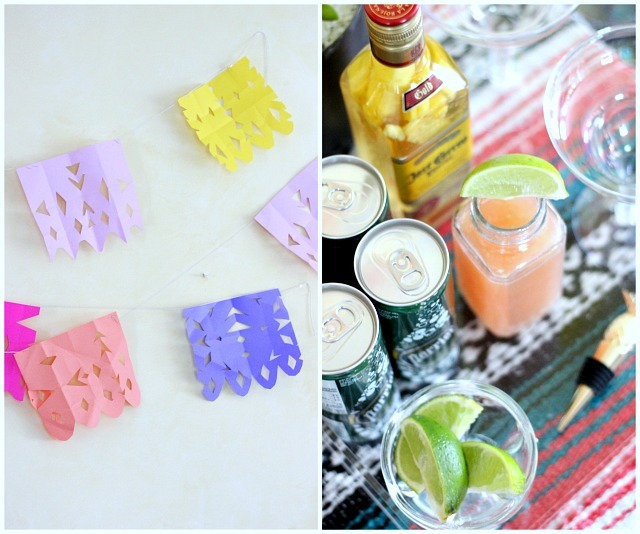 Throwing a Cinco de Mayo party does not need to be intimidating or pricey! All you need is a few key dishes to set the Mexican mood. A couple fun decorations also make the theme come alive! What do you think of my Cinco de Mayo fiesta? I'd love to hear your plans. 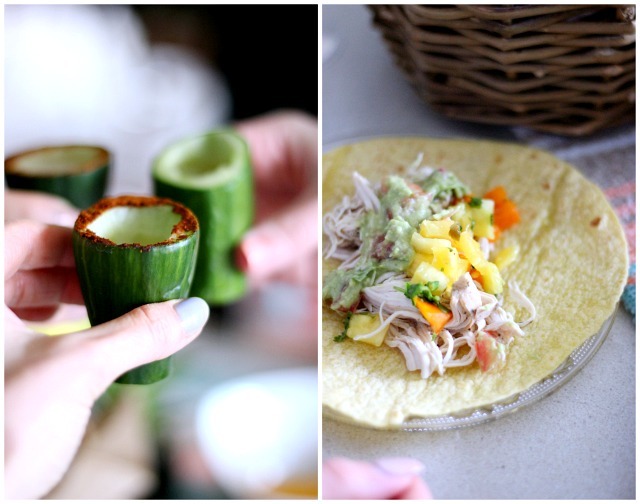 Why not try a few of these ideas/recipes and have yourself a Mexican inspired evening? Looking for outfit inspiration? Check out this post, or this post. I saw your snapchat with the pineapple salsa and practically drooled on my phone. Thanks for sharing the recipe, girl, I'm definitely going to try it! 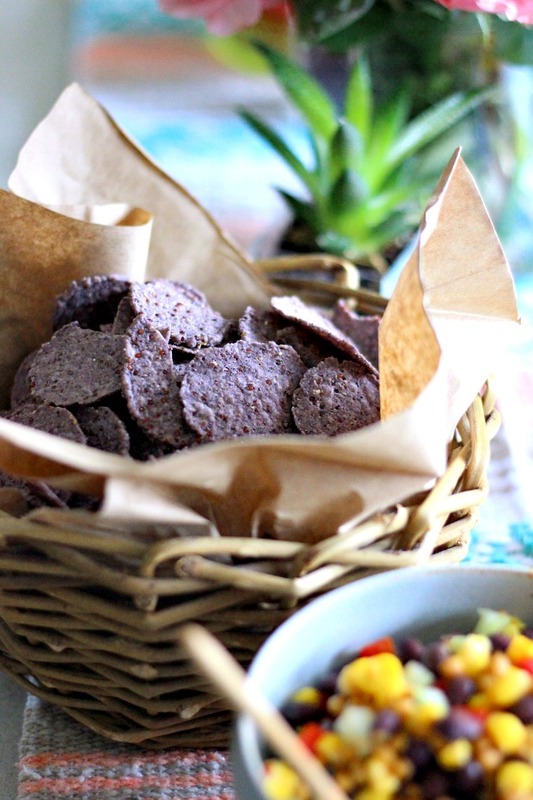 Mexican food is one of my favourites, so all of these recipes sound so good! Definitely have to try the recipe. 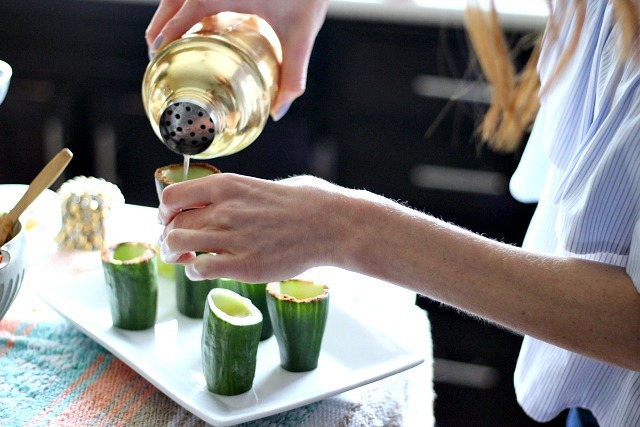 Love the cucumber shot glass idea, so cute and creative.